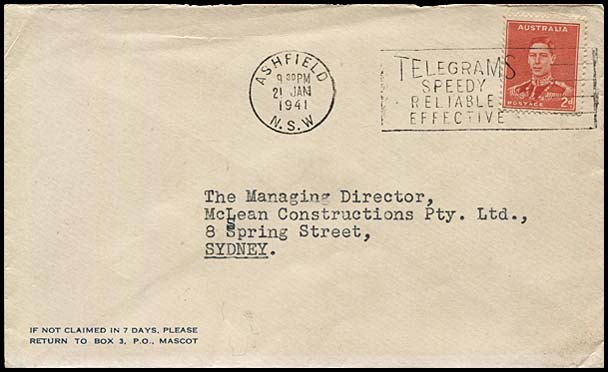 Slogan cancellations: Telegrams: Speedy, Reliable, Effective. 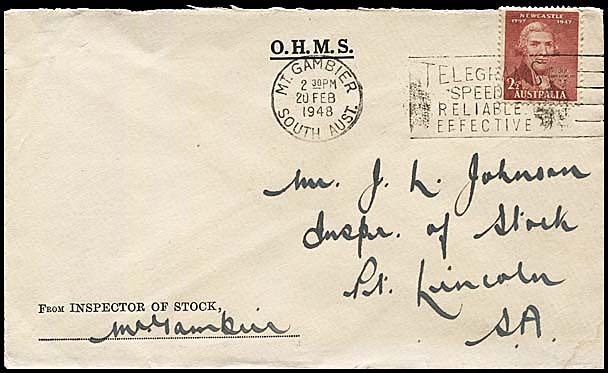 Earliest recorded date: 4 September 1939 at Sydney. 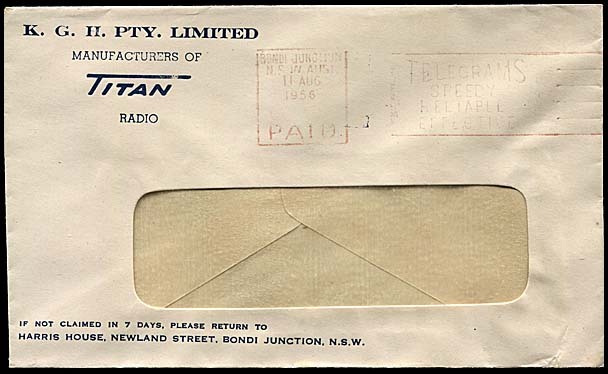 Latest recorded date (1st issue): 7 May 1941 at Chatswood. Its use in this period is now rated scarce. Wallen claims this slogan was introduced in 1938 but there is no recorded evidence of its use before the second half of 1939.
at Ashfield (1 December 1968) - after having also been used in 1941. The height of the slogan was 20 mm. The width varied. There are 30 examples of this slogan in the Census. E of TELEGRAMS is approximately aligned above both R(eliable) and E(ffective) - the latter outdented sightly. the upright of E is above the middle of P of Speedy. B and T (in Reliable and Effective respectively) are aligned at their centers. 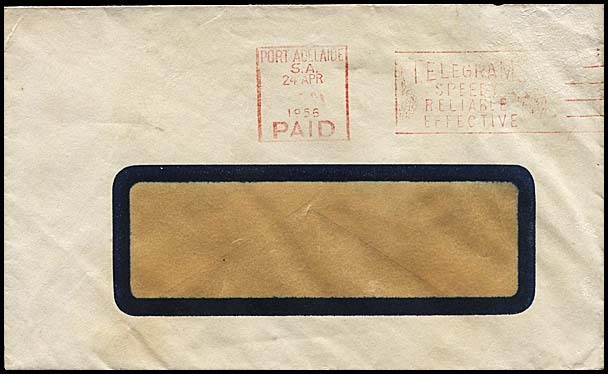 E of TELEGRAMS is approximately aligned above E(ffective) while R(eliable) is indented to nearly above the first F.
the T (of EFFECTIVE) is aligned between the AB of RELIABLE. 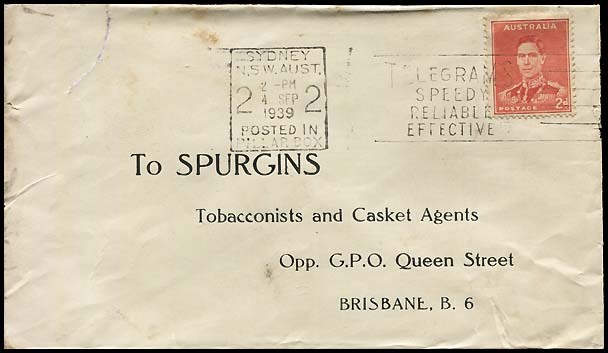 Only recorded on one cover - Sydney 1 on 24 April 1941 IN PILLAR BOX (latest recorded date of any use of this slogan). 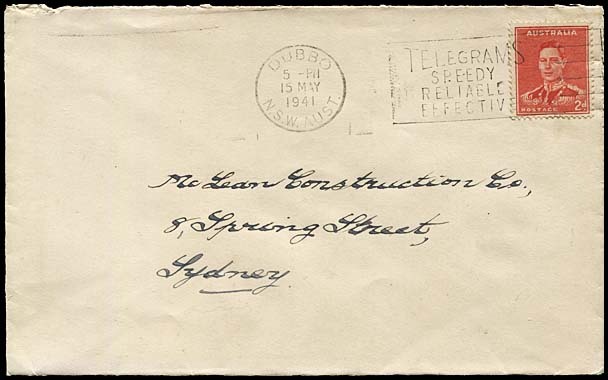 both the R(eliable) and the E(ffective)are indentedcompared with the 1st E of TELEGRAMS. E and P are aligned. the verticals of both B and T (in Reliable and Effective respectively) are aligned at the left. 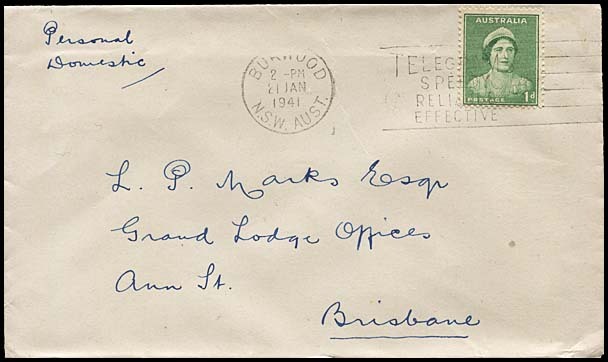 the inscription at the base of the date stamp component: about half had a State reference, a quarter had PAID and the remaining quarter (all in NSW had type of box). On a advertising window envelope for K.G.H. Number in the Census: 5. 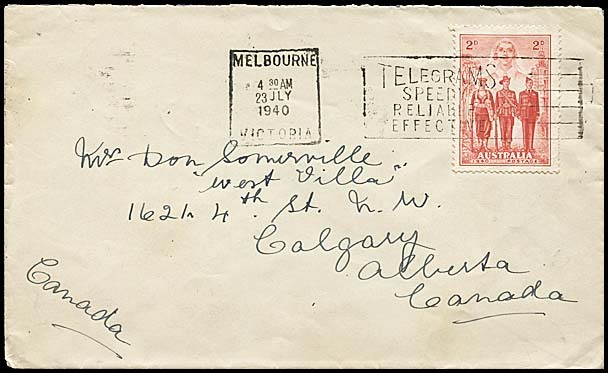 28 January 1941 on a censored letter to Detroit, USA.